Julio and Julio Group has chosen Metso's Haul Truck Solution to reduce the operating costs and improve the performance of its truck fleet in the São Domingos quarry in Sorocaba, Brazil. This investment is estimated to reduce operating costs by 30% over the long term. The São Domingos quarry has a capacity of about 1,200,000 tons of crushed stone per year and is located in a 1,500,000 m² area in Sorocaba, São Paulo state, Brazil. Julio and Julio was looking for a hauling solution that meets the current market specifications, utilizes the latest technology, and adheres to environmental legislation. 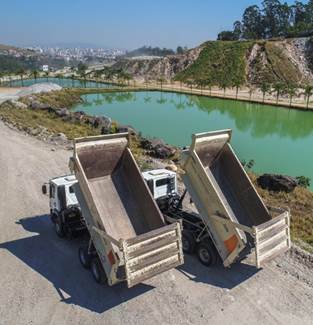 "The high-performance rubber truck lining solution will give the quarry greater maintenance flexibility, reduce fleet downtime and increase productivity," says Ricardo Bonadia, Industrial Manager of the Julio and Julio Group. "We are looking for a reduction in our operating costs. The Metso solution meets our needs and is an industry benchmark," he explains. Caption: Metso's Haul Truck Solution in operation at Julio and Julio Group's São Domingos quarry in Sorocaba, Brazil. The lining installed on trucks maximizes fleet availability and productivity, reduces noise during loading and unloading, improves driver comfort and maintains truck suspension. The perceived noise is reduced by 50% or more and the shocks and vibrations by 95%. Another advantage of Metso's rubber truck lining is its modular composition. When replacement is required, only the worn modules have to be changed. Bonadia also highlights the wear life of the truck linings. Metso's rubber linings typically last four times longer than steel linings. "Before, we used steel plates that had a wear life of about 2,000 hours, and the truck required a 2- or 3-day maintenance stoppage due to the number of welds. Avoiding this was one of the key factors when choosing Metso's Haul Truck Solution," Bonadia continues. "The aggregate market in Brazil is showing positive changes, customers are seeking to modernize their plants and equipment' in hopes of significant cost reductions. Metso rubber truck lining makes a big difference in this sense, and Julio and Julio realized its benefits, not only for the truck body but also for the whole truck. In the aggregates segment, we have several applications with our truck lining, and customers are showing great satisfaction with the product," says André Misael, National Sales Manager at Metso.